The Kenyan government has been carrying out a controversial crackdown concentrated in the Nairobi neighborhood of Eastleigh in response to a string of attacks in Nairobi and Mombasa attributed to al-Shabaab and its sympathizers. The security sweeps are also part of Kenya’s ongoing efforts targeting documented and undocumented refugees–who are seen as security threats even as most of them fled various types of insecurity in their home country. 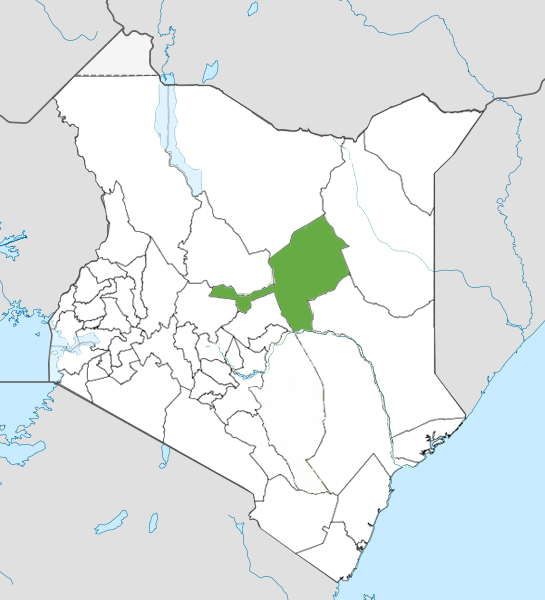 Kenyan security forces have arrested upwards of 3,000 people–including many ethnic Somalis–in operations involving house searches (where the question of whether warrants were issued has been raised,) interrogations at police stations, and most controversially the detainment of about 1,000 people at Safaricom Kasarani stadium where an immigration status verification process is being conducted. 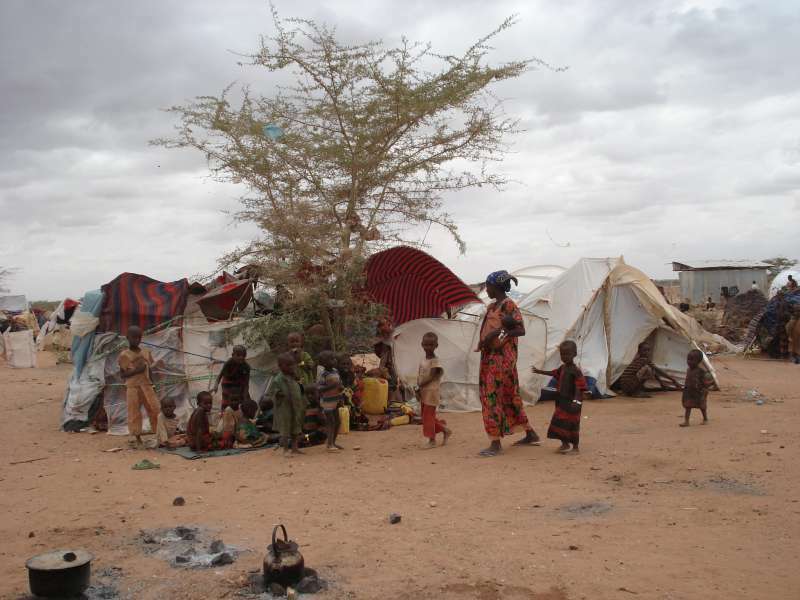 Notably, the number at Kasarani has dwindled as the Kenyan government has reportedly released those with proper papers, sent certain documented refugees to camps, or repatriated undocumented Somalis to Somalia. 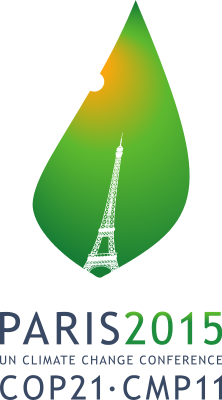 Unsurprisingly, the operations have generated a huge response in social media. 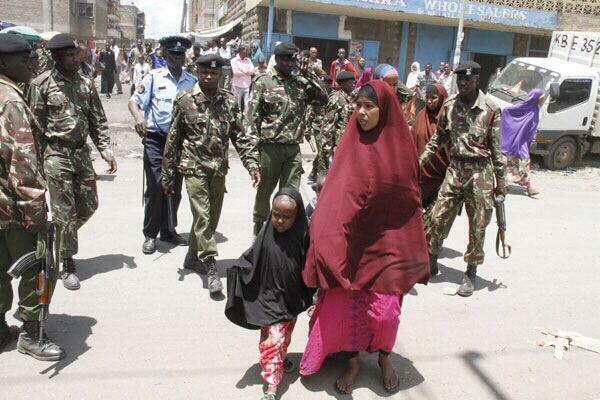 Kenyan media has framed the security and social crisis in the country with the hashtag #TideOfTerror. 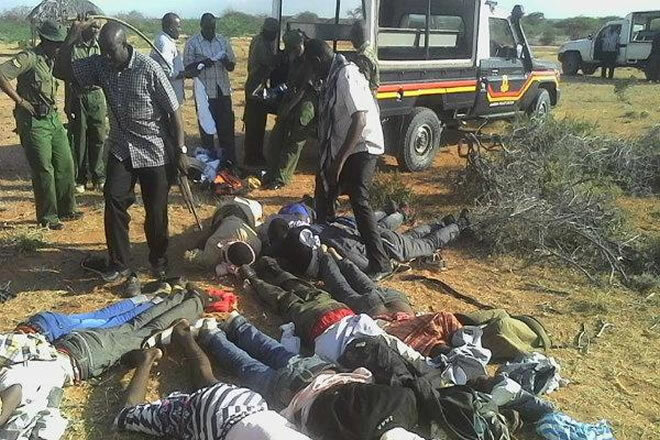 KTN also aired a special interviewing security analysts and families of those extrajudicially killed by Kenyan security forces to raise the question: do extrajudicial killings stop or encourage terrorist attacks? 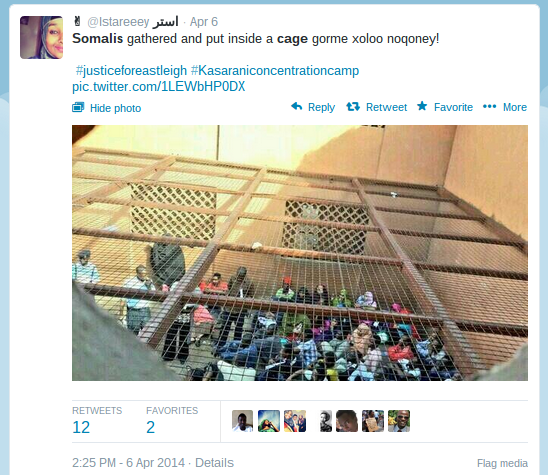 By comparison, the questionable process and environment of detainment at Kasarani stadium sparked the #KasaraniConcentrationCamp hashtag, which first sprang up on the afternoon of 5 April 2014. At question with Kasarani and the operation more broadly was the legality of house searches and seizures carried out by security forces and whether the arrest of about 3,000 people was in line with habeas corpus and other Kenyan laws. 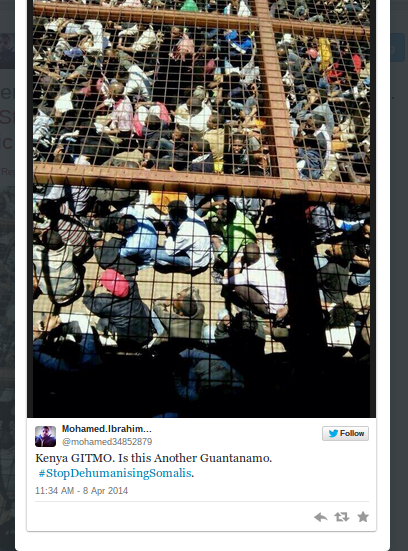 In one shockingly tweeted photo, a group was shown en masse in a cage, prompting a commentator to ask “Gorme xoloo noqoney?” – When did we become livestock? With much of Twitter commemorating the 20th anniversary of the Rwandan genocide, many were not convinced that Kenya was heeding the consequences of dehumanization inherent in ethnic profiling and targeting. Others drew comparisons of the Kasarani detainment to the violent and repressive response of the British to the Kikuyu-dominated “Mau Mau Uprising” during the colonial era–which is an interesting comparison given that Kenyan president Uhuru Kenyatta hails from the Kikuyu tribe and is currently facing ICC charges (in an increasingly faltering case) for inciting post-election violence from 2007-08. Even more relevant, many on Twitter compared the Eastleigh crackdown to the “Wagalla Massacre” in 1984 in which the Kenyan government summarily slaughtered ethnic Somalis in Kenya who were in dispute in the northeastern district of Wajir. The question of what it means to be accepted as a Kenyan patriot with Somali heritage — versus other Kenyan tribes (Luo, Kikuyu, Kalinjin, etc.) — was an important narrative that arguably is not discussed sufficiently in open and civil public forums. 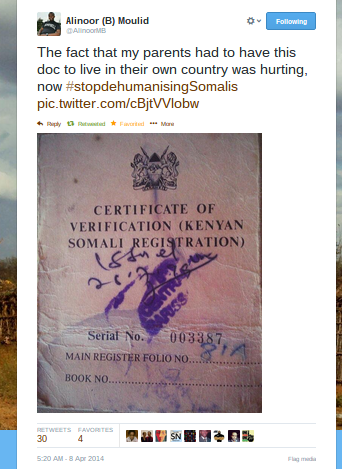 The #StopDehumanisingSomalis was a complementary hashtag to this discussion. Even as colonial and post-colonial rule in Kenya had different impacts among the country’s social groups, the treatment of Somalis has always seemed to fit into a distinct historical context. 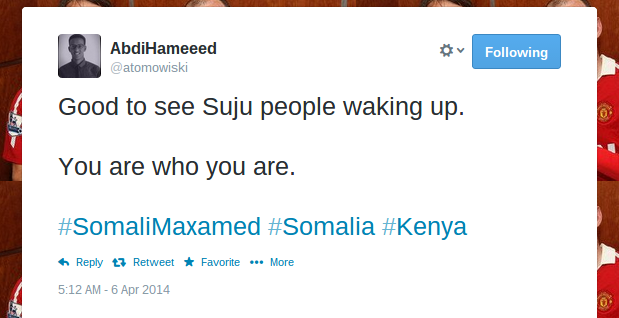 For many Somalis whose families have long been in Kenya, the question of Kenyan-ness versus Somali-ness (Somalinimo) has always been an interesting question. 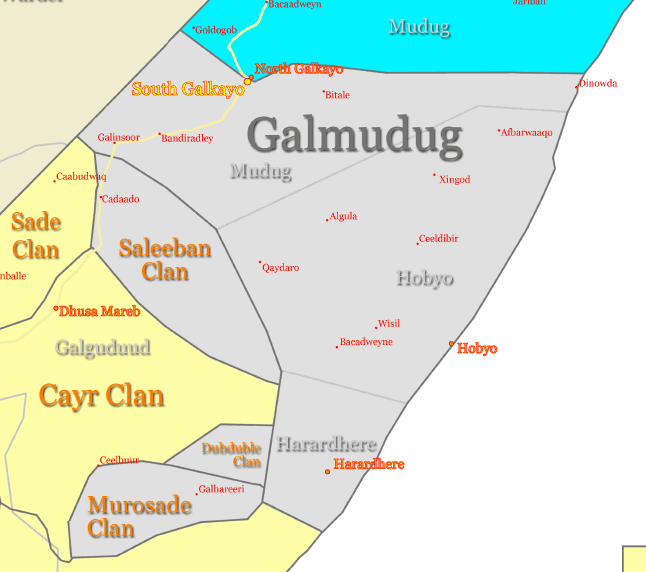 Somalis of this particular upbringing are often termed pejoratively as Sijuis — a slang Kiswahili phrase literally meaning “I don’t know” — due to their geographical and perceived cultural distance between them and Somalia. 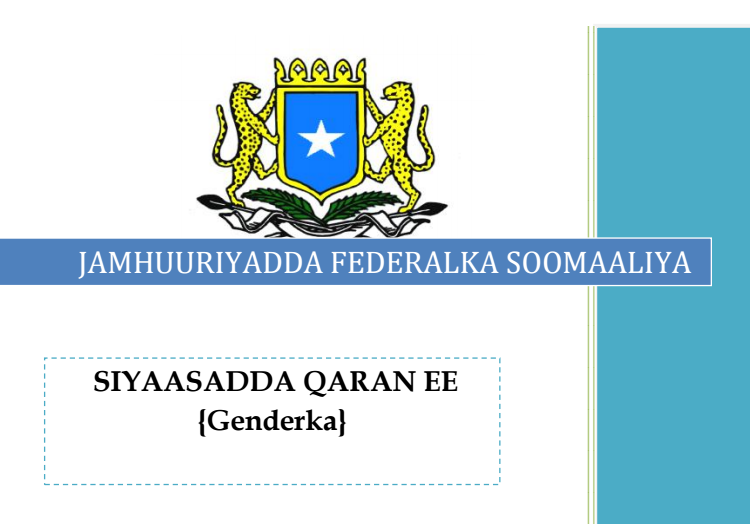 And yet, there is still a feeling among some Somalis that their identity is perpetually hyphenated — Kenyan-Somali — in a way that is unheard of for other tribes. For example, “Kenyan-Luo” or “Kenyan-Kikuyu” are rarely used terms — especially in reports about crime or corruption. 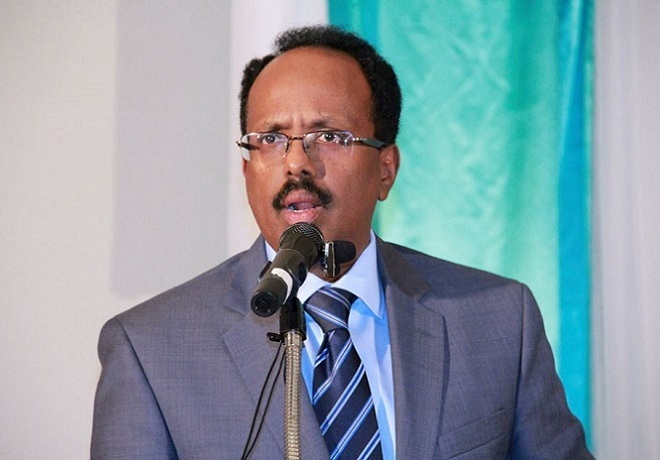 The Somali government’s response has been perceived as tepid, and President Hassan Sheikh Mohamud has been blamed for continuing his busy foreign travel schedule rather than standing up for Somalis. 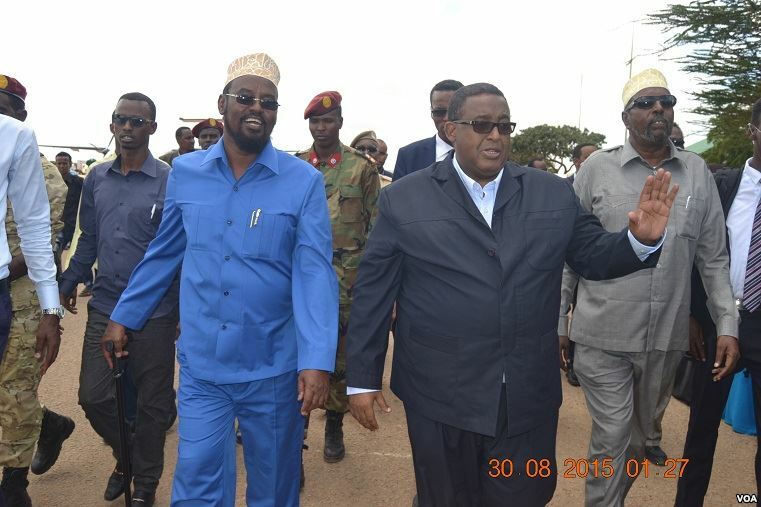 Prime Minister Abdiweli Sheikh Ahmed’s response to the crackdown has also been notable. His press release about his meeting with Kenyan Foreign Minister Amina Mohamed strangely conflated terrorism and refugee issues–or at least failed to separate them. This is important given the way in which Kenya has tied the two issues together, often to the detriment of local and international laws pertaining to the treatment of Kenyan citizens and all refugees. In a stunning social media absence, neither @TheVillaSomalia or @SomaliPM Twitter accounts addressed the operations in Nairobi. 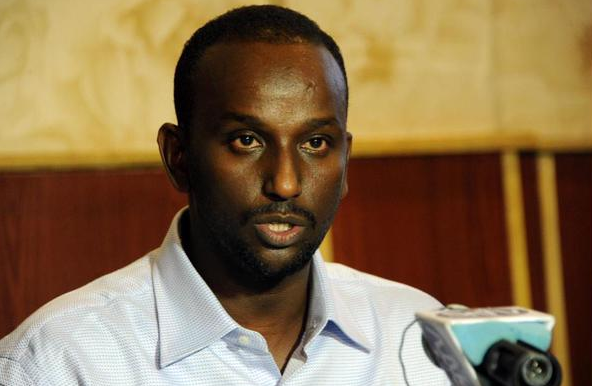 However, outlets such as SomaliMemo and other pro-Shabaab sites were eager to take advantage of the Kenyan government’s harsh operations and the Somali government’s weak response to the crackdown. 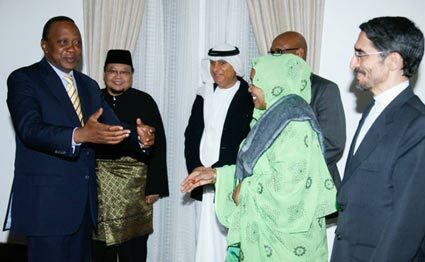 The image of Somali President Hassan Sheikh Mohamud enjoying the luxury of jet transportation with President Uhuru Kenyatta while Somalis in Eastleigh are loaded as prisoners onto trucks was used as a powerful image. In addition to trying to draw support from viewers online, al-Shabaab and affiliated extremists on the ground likely will use these images for recruitment purposes. Immigration politics, security, and social relationships are in many cases all too connected in the worst ways. There was a low number of reported cases in which Kenyan security forces found illegal weapons or grenades among the hundreds of homes it searched–and in one case honey and black seeds oil were mistaken as explosive material. The unconvincing ratio of weapons found to houses searched shows that the campaign of ethnic and religious profiling is not only ineffective but inefficient at reducing the security threat in Kenya. 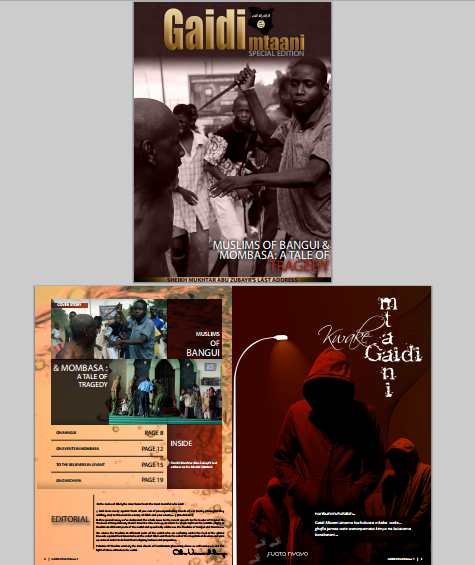 Many people told stories to the media about Kenya security forces seeking bribes from law-abiding persons with proper identification–showing that the campaign was as much an opportunity for exploitation rather than anything else. 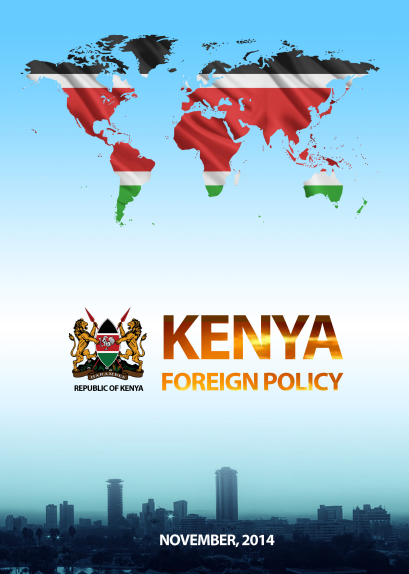 Of course, Kenya has a right to pursue those who are illegally staying in the country — in a legal manner. 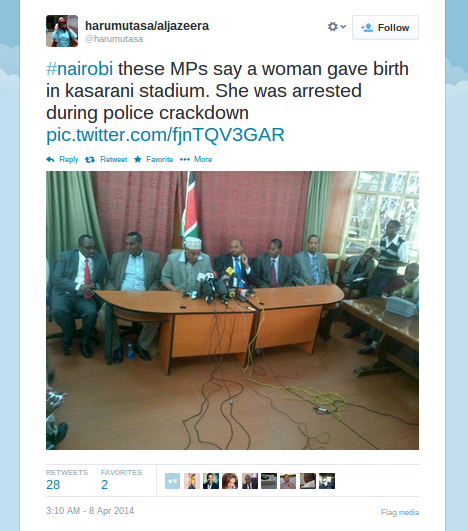 But the current operation is so wide and unregulated that is a questionable way to do so — and the fact that UNHCR and other NGOs have not had access to Kasarani stadium where many are being held is a red flag that potential rights violations may be occurring, especially since reports indicate at least one pregnant woman gave birth at the site which is clearly is not appropriate for medical procedures. If the Kenya government wants to truly implement an effective community security program in Usalama Watch, it will be critical not to isolate and discourage cooperation among the very community that may be willing to provide useful information if it finds the Kenyan government as a trusted partner. When it comes down to security, the most efficient and effective strategy is to use local and international cooperation, technology, and corroborated evidence to go after real targets. Kenya’s strategy of controversial mass arrest campaigns mostly against ethnic Somalis and Muslims may convince the public that the government is doing “something” to make the country more secure. 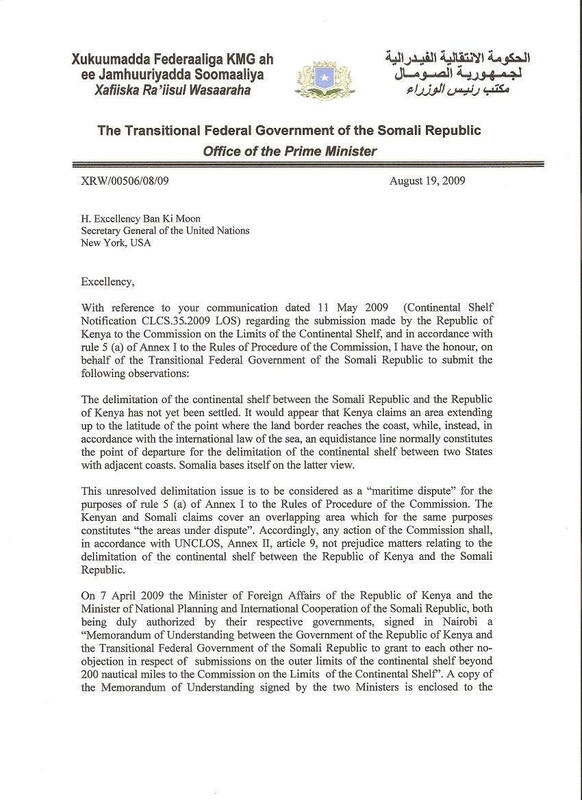 But, the inability of the Kenyan government to predominately capture actual threats, to acknowledge that non-ethnic Somalis are also vulnerable to extremist recruitment, and to sufficiently address insider corruption that allows criminal and extremist elements to thrive are failures that will bear the most serious consequences for security in the country.